Worldwide scientific and medical communities have called fibre the "miracle nutrient" because it helps address weight control issues and can reduce the risk of health related complications. Foods that are generally high in fibre are being consumed less due to the increased intake of over processed convenience foods. Getting enough fibre each day has been proven to help fight illnesses such as obesity, heart disease and diabetes. Lifestyles has developed a revolutionary and proprietary soluble fibre blend that helps to supplement the body's deficiency of fibre. Fibrelife provides you with your daily source of fibre, while helping you regulate your appetite and achieve and maintain a healthy body weight. Each capsule of Fibrelife contains 500mg of soluble fibre derived from concentrated, natural sources such as Konjac Glucomannan, Guar Gum, Xanthan Gum with added cinnamon extract. When ingested with sufficient amounts of water, Fibrelife forms a gel-like complex of natural fibres. This complex slows the digestion of food and creates a feeling of fullness. At Lifestyles we strive to formulate premium quality, natural source nutritional supplements and healthy eating habits, to help you live better every day. 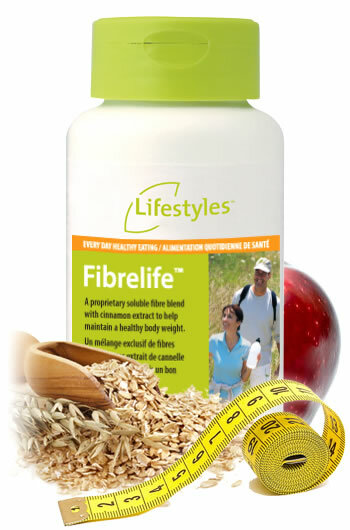 Get your daily dose of fibre today with Lifestyles Fibrelife!